Throughout the year, and especially during the holiday season, many people find themselves in desperate financial circumstances. When shopping for themselves or loved ones for food, or clothing, or other items, many people will take risks that they otherwise would not take. From undercover agents posing as shoppers to cameras placed throughout the store, most retail establishments are armed with sophisticated measures to combat and respond to theft. If a person is detected by store security, they can be held and detained for a reasonable time for investigative purposes until police arrive. Georgia law defines shoplifting as any act by someone who (1) conceals or takes possession of the goods, (2) alters the price tag, (3) transfers the goods from one container to another, (4) interchanges the label or price tag, or (5) wrongfully causes the amount paid to be less than the merchant's stated price for the merchandise. OCGA 16-8-14(a). Georgia law changed this year making the theft of an item, or items with a collective value of $500 or more a felony. This is up from $300. 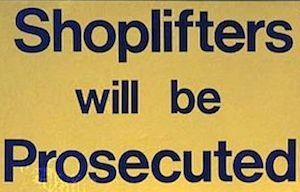 If a person is arrested for misdemeanor shoplifting they face up to a year in jail and/or probation, and up to a $1000 fine. Some things, however, make the potential consequences much worse. A second conviction for misdemeanor shoplifting carries a minimum $500 fine; and a third conviction carries a sentence of 30-120 days in jail or house arrest; and a fourth conviction for shoplifting, regardless of the value of the item/s taken, is a felony. A person faces 1-10 years in prison for felony shoplifting. An arrest for anything can be a life altering experience. But arrests for theft offenses can have particularly devastating consequences making it extremely difficult to seek future employment. That's why many jurisdictions offer pretrial intervention and diversion programs for first time offenders as an alternative to prosecution, affording them opportunities to clean their records and get a second chance. Throughout the year, but especially during holidays when retailers are particularly vigilant, call Cohen and Hirsch Criminal Defense if you find yourself needing help and guidance through the court system due to an arrest for shoplifting.